I love books where kids have to think a little before they make predictions about what will come next. I loved Q IS FOR DUCK. The kind where kids are sitting on their knees by the second page, dying to see the pictures so they can predict what will come next. 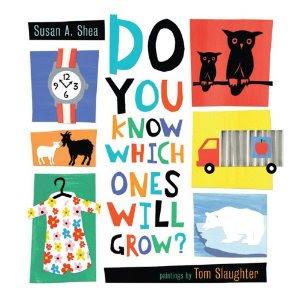 DO YOU KNOW WHICH ONES WILL GROW is another book I'm going to put into my "predict-a-little, think-a-little, kids are for sure going to love this one" category. Until they crack or rust or fade. From then on, each half of two page spread contains a couplet. the right hand side is non-living. Now, here comes the really fun part, and the part I know that kids are totally going to love. Each right hand page is a fold out, where you have to lift a flap to see the answer. And each flap is a different size or opens a different direction. The flap on the stool page, for example, lifts from the middle of the page up, and the stool becomes a chair. Tom Saunders' illustrations really complement the text. They are bright colored and eye catching- simple shapes placed on top of other shapes, in kind of a collage-ish effect. on living and non-living things. You could use this book for teaching reading strategies. It'd be a great book for teaching readers how to cross-check pictures against beginning sounds. You could give it as a baby present. Or you could just read it aloud. And kids are going to love it. I just put this on my pre-order list. I can't wait for the next few months as all the books I've ordered trickle in. This was my first visit to your blog, which I found from twitter. I've been sitting here on this early morning "I can't sleep." adventure, enjoying your thoughts and reflections on reading and teaching and being a learner. Thank you. Oh, and why can't PA name the newfie Milton? :) I think it's perfect. I was with you on the 'choose a boy' part, though. My daughter has a 9 mo old newfie boy and I can't imagine a sweeter dog.